St Mary Redcliffe Guild. 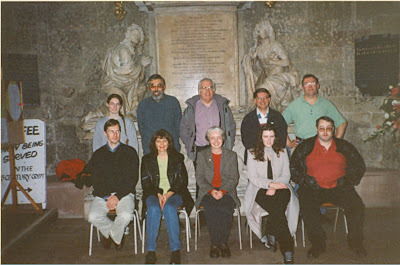 Seated L to R: Kathryn L. Carter (1), Mary C. Friskney (2), Anthony M. Bulteel (3), Graham L. Sparey (4), David R. Ware (5). Standing L to R: Alison R. Caton (6), Stephen J. Bateman (7), Clive G. Bryant (8), Charles W Pipe-Wolferstan (9), Keith W Scudamore (10). The 22nd competition for the W. W. Worthington Memorial Trophy was held at the new venue of Tamworth on Saturday, 21st October and proved to be an enjoyable and successful event. 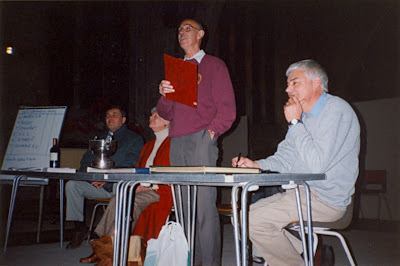 After a brief welcome to the assembled ringers in the church, Alan Burbidge spoke of the shock felt by all at the untimely death of Peter Border, which had occurred the previous Wednesday. Peter had an enormous reputation in ringing and so many good friends in the Exercise. The company stood in silence for one minute as a mark of respect. Understandably the Coventry D.G. had withdrawn from the competition. Peter and Ruth would have been ringing in the band. It was also announced that the St Martin’s Guild had withdrawn the previous day, not being able to raise a band. There were consequently six teams competing. The Rev Alan Barratt, the Vicar of St Editha’s, Tamworth, said a few words of welcome to the assembled company before making the draw for the order of ringing. As he picked out the numbered balls from the cup the order emerged as: Derby, Rugby, Stockport, University of London, St Mary Redcliffe and Leicester. This was not a good draw for the holders, Derby D.A., since it is widely acknowledged that to be drawn first is a burden to be avoided! Although not a sunny day, it was at least dry in the afternoon and not too cold, so that waiting ringers could listen to the ringing outside the tower. The bells are indeed quiet outside when the shutters are up, which of course is the reason that such an event can be held now at Tamworth, but they are still loud enough for keen listeners to pick out the niceties of the ringing. The judge had been positioned in a well chosen spot inside the tower where the acoustics were excellent. In true Worthington style photographs of each band were taken inside the church after each test piece was rung. These will be added to the collection of photographs dating back to 1978, the first year of the contest. The whole collection was on display in the church during the afternoon, and as usual provided much amusement as ringers and friends were sharply reminded of how they used to look in those distant days. 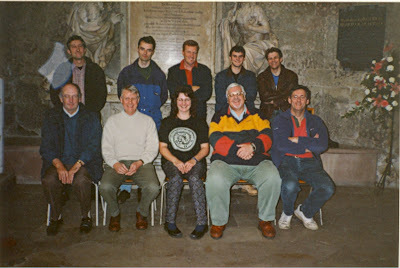 As the afternoon progressed many made good use of the tea and sandwiches provided in the crypt by the Tamworth ringers, under the expert direction of Kay Else. It was a warm and cosy place to take a break. Two of the three towers open for general ringing during the afternoon (Alrewas, Kingsbury) had only one visitor and Polesworth had about ten. It is questionable whether this facility will be required in future years. Thanks must go to the local ringers who patiently opened up just in case. Also of interest was the double spiral staircase, especially in view of the conveniently timed article by John Eisel that had just appeared in The Ringing World. Several ringers were taken up to see it by Andrew Else, either during the afternoon or at the end of the day. At 5.30pm Alan welcomed back the company and also welcomed Mrs V. Worthington, David Beacham and Rev Alan Barratt. 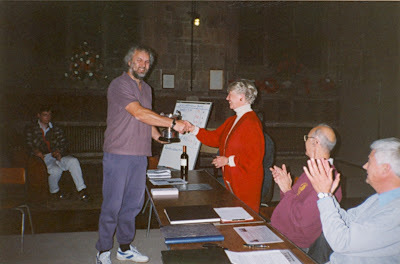 Mrs V. Worthington, the President of the Midland Counties Guild, had travelled down from Richmond to present the trophy. Her late husband, Ben Worthington had given the silver rose bowl to the Guild in 1978 as a memorial to his grandfather, W. W. Worthington. There are many belts and restorations which were due to the generosity of the Worthington family. 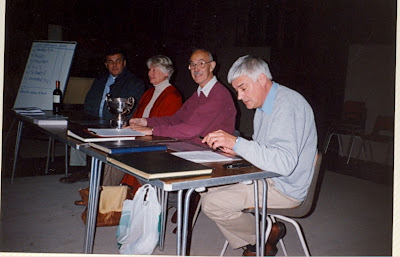 David Beacham was then asked to give his verdict on the ringing. Before doing so he said that he wished to be associated with the minute’s silence for Peter Border, which had of course taken place just before the draw at which David was not present. He also said that he had first rung a peal with Peter 43 years ago! David then began his comments on the ringing. He had not used any impression mark, but simply judged on recorded faults. He explained that, had his usual assistant been available for today, he may well have used some sort of mark for impression, but with one judge it was not really feasible to do so, full attention on the striking being the prime consideration. The first team to ring was Derby, and although starting briskly, they slowed to a peal speed of 3h 18m. Rugby rang next, and after a very fast practice the test piece was choppy overall and at a speed of 3h 6m. Stockport were uneven at a speed of 3h 2m, and although the front four were rung well, some of the other bells tended to be too close. The University of London clocked 3h 12m and the tenors rang well together, setting a good rhythm, but unfortunately not all of the other bells completely supported them, although this did improve. St Mary Redcliffe was the team to ring immediately after the half hour break. They recorded the slowest peal speed of 3h 22m, but their ringing was smooth. Leicester were the only band not to use their practice time, going straight into the test piece. They improved lead by lead and recorded a time of 3h 14m. David’s scoring for faults, which was based on the last five leads of the course of Cambridge Surprise Royal, was as follows. 1st St Mary Redcliffe Guild 49, 2nd Leicester Diocesan Guild 58, 3rd University of London Society 61, 4th Derby Diocesan Association 85, 5th Stockport 123, 6th Rugby Deanery District 128. Keith Scudamore, the conductor of the winning band came up to receive the trophy and said that they had enjoyed taking part and had had a good day. 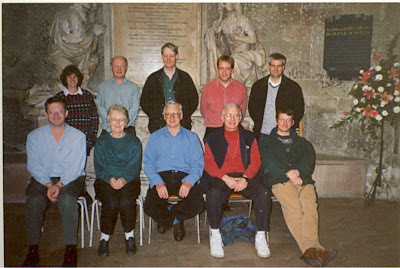 This is the first time that St Mary Redcliffe Guild has entered, but some of their ringers would have rung in the contest before as part of the Bath & Wells D.A. He also received a bottle of wine, kindly donated by the previous holders, Derby D.A. This is now becoming established as a very nice touch! A certificate had been produced for each team, containing colour pictures of St Editha’s Church, and Anne Webb had very kindly come along to write them out during the afternoon, once the names of the ringers were known. Conductors of each band were asked to collect the certificates at the end of the proceedings. Computer generated certificates would be sent on, one for each ringer during the course of the following week. Thanks were then given to various people involved in making the competition go smoothly. We record here thanks to Rev Alan Barratt for allowing the use of the church and bells, Andrew Else, the tower captain for his work on the bells and sound control and for his cordial reception of 60 visiting ringers into his ringing room in one afternoon. Also Kay Else and the several helpers who provided the excellent buffet, Gordon and Elaine Lane, who took the photographs and ensured smiling faces on them all, David Blick who designed the web page for the event and was on hand throughout the afternoon providing valuable help, Anne Webb for writing the certificates, David Beacham for the arduous task of judging which he carried out with expert authority and Mrs Worthington for presenting the trophy. The proceedings ended with Gordon Lane thanking Alan for the organisation. A provisional date of 20th October 2001 has been set for the 23rd Competition, but firm details including venue will be decided early next year. 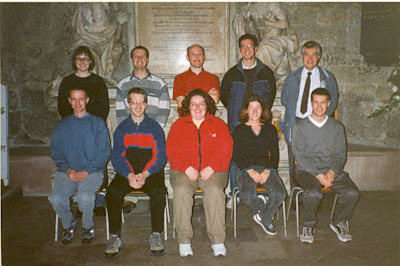 Simon J T Smith, Angela S Franklin, Gail L Wade, David G Carling, Anthony J Fisher, Caroline J Smith, Mark J Pendery, Terry M Astill, Richard J Angrave, R Kingsley Mason. 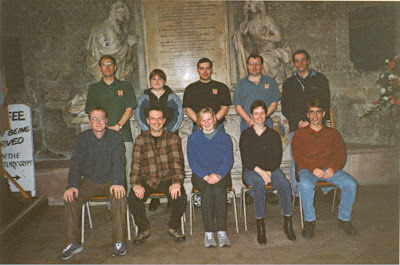 Christian M Peckham, Robert B Smith, David J Marshall, Patricia A M Halls, Simon C Melen, Frances E Haynes, John E Heaton, Simon Humphrey, Timothy J Peverett, Paul Jopp. 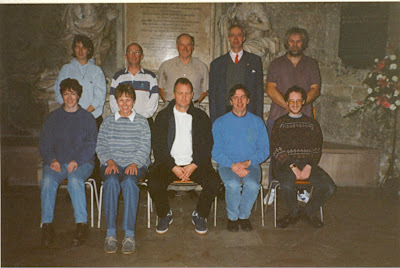 John E Goddard, A John Illingworth, Andrea C Haynes, S Clarke Walters, John Slack, Anthony E Gillias, Paul McNutt, Timothy J Wykes, Thomas W Griffiths, William R Haynes. David Beacham gives the results. Keith Scudamore collects the cup from Mrs V. Worthington. Rev Alan Barratt, Mrs V. Worthington, David Beacham and Alan Burbidge.